Tiamat was always a vicious and immature tyrant. She never took responsibility for anything, especially her failures. It led to divisiveness within her own family and slowly, over eons, even within the ranks of the chromatic dragons that worshipped her. She had many grand promises about her victory upon the Prime Material Plane of Faërun and once again, failed to deliver. But this time, many chromatics, especially the elders had been whispering about what should be done if she failed them all yet again. Especially, with the sacrifices their own kind had made in her most recent schemes. A subtle and resourceful cabal was formed, they chose no name for it, so it would be harder to trace their actions and they began to seek a new God for their kind. Many of the elders told of the exploits of Tiamat and Bahamut's eldest brother, Vorel. He was a mighty and cunning indigo dragon, his only flaws were his love for his younger brother, Bahamut, and being born without wings. Flaws that Tiamat had exploited to murder him. Their tales of his exploits, of his prowess, of his brilliance spread like a fever amongst the conspirators of the cabal. A plan began to form. That plan would require the Wand of Orcus and it would be necessary to use it upon her in her home in the Abyss, the Dragonspawn Pits of Azharul. And what better way to find the Wand than to use Adventurers, the very bane of Tiamat and her chromatics? The cabal planned long and well and they succeeded. Tiamat lay dead in the Abyss and they had found the remains of long dead Vorel, his skull and his left arm. And so they elders used their considerable magic to raise him from the dead. While the elders of the cabal had told of Vorel's exploits and planned for Tiamat's demise, none of them had considered what, if any, side affects there would be to the necromancy they used to bring Vorel back from the dead. After all, Vorel, the Indigo Dragon, had been dead for many, many eons. Perhaps he had found a form of peace? Perhaps he had become a part of the very Multiverse? Perhaps there wasn't much of his mind left when they raised his body? The elders immediately knew something was wrong as Vorel's howl of rage could be heard for miles and like a bolt of deadly lightning he was upon Nicovaren the Black, tearing through the ancient's neck and ripping out his heart. Before Lenavossalorn the Blue could even take flight, Vorel had gouged out her eyes, torn off her wings and gutted her from stem to stern. None of the conspirators who raised long dead Vorel survived that long and bloody day. Their actions released a fearsome beast upon Faërun that day. Vorel now roamed the land, destroying anything he crosses. 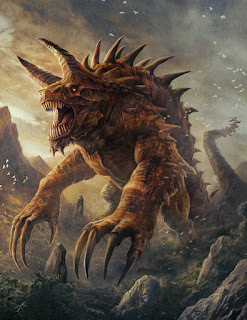 But most know him by the name the Giants had given him, Tarrasque.